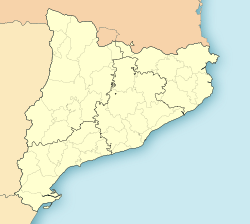 Cerdanyola del Vallès (Catalan pronunciation: [sərðəˈɲɔɫə ðəɫ βəˈʎɛs]) is a municipality in the comarca o the Vallès Occidental in Catalonie. It is situatit on the north side o the Collserola ridge. The toun is servit bi the A-7 an C-58 motorweys, the N-150 road and the Renfe railwey commuter lines R4, R7 an railwey regional line Ca4. It is well kent as the steid o the main campus o the Universitat Autònoma de Barcelona (at Bellaterra). As befits a municipality which haes increased its population mair than fiftyfaud in the last hunderyear, maist o the biggins are modren. The pairish kirk is in a modrenist style, while the Sant Marcel castle haes been rebuilt in a neogothic style. The botanical gardens o El Pedregar (also at Bellaterra) hae a notable collection o sculpturs. Iberic remains hae been foond at El Turó de Ca n'Oliver. Thare are several remains frae Roman times, includin a aqueduct, a amphitheater, an a tradin route tae Barcelona.